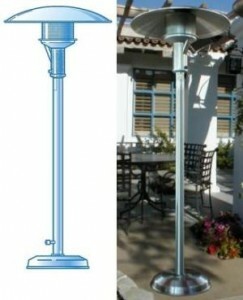 The Sunglo free-standing heater model A242, is ideal for open patio designs. This model offers the flexibility to more or remove the heaters as needed. An optional tie-down kit is available to secure heaters to patio deck when required. An optional 12′ quick disconnect hose can be used with a ant-trip ramp to provide high flexibility of placement. Heat coverage varies depending on the wind exposure on patio. The average spacing for the A242 is 12 feet apart. This heater offers a large deep disk aluminum reflector for maximum comfort, a primary aerated burner for minimal noise, and 100% safety shutoff. The post is available in a variety of colors including black, green, and bronze powder coat finishes or 304 stainless steel. A242 free standing heater models are ideal for situations that require more flexibility. Heaters can be easily moved about the patio, or completely removed when not needed. Optional quick disconnect hose system allows heaters to be easily disconnected and stored without the use of tools. In Public facilities, a means for attaching these heaters to the deck or patio may be required. A Tie-Down Kit is available from the factory. We also provide an Anti-Trip ramp that goes over the quick disconnect hose system to allow for a worry free installation. The required clearance from combustible materials must be maintained on all heaters. In addition the heater must have adequate fresh air and ventilation to operate properly. Make sure you can meet these requirements before making your heater selection. The primary use of the information above should be used for heater selection only. It should not be used as the sole guide in placement and installation of these heaters.